This post about trying to set a 10K PR has been sitting around in my drafts folder for over six months. It seems relevant to today, when I headed over to the track to do speedwork for the first time in six months. Alas, the lacrosse team was practicing, so I’ll have to wait for another day. But at least I can post this. 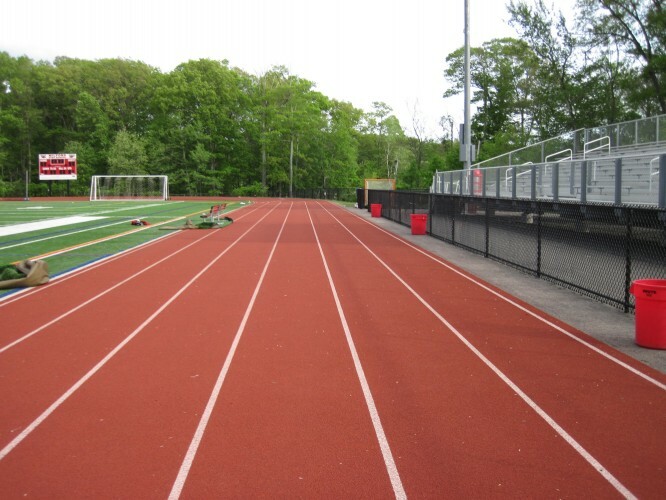 I tried to remember my best 10K time as I ran from my house to the track for a little warm up, but I couldn’t. An online race-time calculator estimated that I should be able to run it in 43:47 based on the 5K I ran in 21:00 a couple of months ago, which was almost exactly the same time as my season-opening 5K in April. I figured that if I was below 45 minutes, I was going to call it a PR. (I’ve since looked it up. I ran a 44:58 at the 2002 James Joyce Ramble.) As I changed into my track spikes and did a short warm up lap, I figured that I would need to run better than 7:15/mile (4:30/km). Rounding the corner at a jog, I hit the start line, started my watch, and picked up the pace. The track wasn’t too busy, and I only occasionally had to swing wide to pass other walkers and runners. 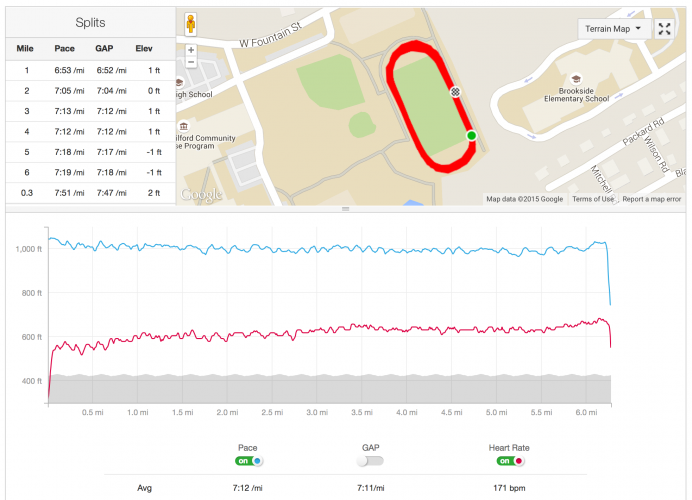 The 10K would require 25 laps of the 400 meter track, and I tried to hold back a bit. True to form, though, I did the first mile too quickly: 6:53. At first I wasn’t thinking about the number of laps I would have to run. Twenty-five is just an abstract number when you’re not that tired, but it became much more concrete the further into the run that I got. So I decided not to think about it. Instead I thought about my pace and what was going on around me. Some students started a pickup soccer game. At one point a ball crossed my path, and I kicked it back better than I ever did when I played soccer as a teenager. Runners came and went. At one point, a father and his two young children started running, and every time I ran past them, the five-or-so-year-old would race me. It was pretty cute. My time? 44:27! Woot woot!